Author: Zephaniah, Benjamin Set In . . .
An eye for an eye. It's very simple. You choose your homeland like a hyena picking and choosing where he steals his next meal from. Scavenger. Yes you grovel to the feet of Mengistu and when his people spit at you and kick you from the bowl you scuttle across the border. Scavenger. As a violent civil war rages back home, teenager Alem and his father are in a B&B in Berkshire. It's his best holiday ever. The next morning his father is gone and has left a note explaining that he and his mother want to protect Alem from the war. This strange grey country of England is now his home. On his own, and in the hands of the social services and the Refugee Council, he lives from letter to letter, waiting to hear something from his father. Then Alem meets car-obsessed Mustapha, the lovely 'out of your league' Ruth and dangerous Sweeney – three unexpected allies who spur him on as Alem fights to be seen as more than just the Refugee Boy. 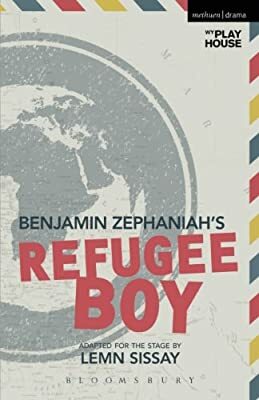 Based on the novel by Benjamin Zephaniah, Refugee Boy is an urgent story of a courageous African boy sent to England to escape the violent civil war, a story about arriving, belonging and finding 'home'.